To appreciate, respect and preserve the excellence and diversity of human heritage the world-over in the areas of culture including architecture, classical and folk art forms, literatures and languages, education, moral values and social conduct, sports, health care, healing, social welfare, to discover strains of affinity among these through intellectual interaction and live presentation and to engage in humanitarian and disaster relief. Preserve and document all tangible & intangible, traditional forms of arts and culture. To promote music by sensitizing the common people to the musical values in classical and folk traditions, and educating the musically inclined, so as to create a symbiotic pattern with the divine ethos of spiritual traditions. To help revive the dying Rebābi Kīrtan/music and make all out efforts to restore this historic tradition to its pristine glory. Undertaking archival research to bring alive the craft of making traditional musical instruments and their use, reviving and restoring the art of percussion and other related instruments so as to organize a symphonic orchestra in order to propagate traditional forms and at the same time stimulate creative expression within the framework of the traditional forms. Establish a world-class old age home/village, having a separate endowment fund, for exponents of all activities associated with the Foundation. Provide elderly artists a monthly pension and/or free health care facilities or assistance as a mark of respect for their lifetime achievements. To set up ANĀD Sanmān, annual awards in the fields of music, dance, sports, science, technology, art, literature, theatre, cinema and handicrafts, etc. and for life time achievements in fields that the Trust is directly or indirectly concerned with.  Set up the ANĀD Conservatory: An Institute of Arts, Aesthetics, Cultural Traditions and Developmental Studies, which intends to provide in-house training and education in music (vocal, instrumental and percussion), offering also training in yoga, martial arts, various forms of performing art, including classical and folk dance forms, along with theoretical studies on art, aesthetics and the study of scriptures from various traditions with the purpose of facilitating inter-faith dialogues and enriching our understanding of the diverse cultural and religious traditions. To encourage the culture of sports in terms of continued heritage as well as the modern formats. To promote, establish, set-up, run, maintain, assist, finance, support and/or aid in the setting up of educational institutions, schools, colleges; to establish centers in India and abroad, for propagating devotional music and; to enter into contracts, partnerships and make agreements with institutions or concerns working towards the fulfillment of the objectives of the Trust.